I have joined APY without an Aadhaar Card. Bank informed me that I can join now and can provide aadhaar number later after I receive it as there is yet long years for me to complete APY. I have received APY account number and my 2nd month payment is also deducted. I have taken APY last month. My age will be 26 in September 2015, they should deduct 376 rupees from my account, instead they are deducting 446 rupees drom ky account. Can anyone help me with this. Sir, i am working in BSNL . i have EPFO subscriber. MY QUE IS how track ATAL PENSION YOJANA. For more accurate information on Atal Pension Yojana kindly contact your local bank. Is this Plan available for HDFC customers.I am holding a savings a/c with HDFC and aged 39 yrs.Am i eligible to buy this plan? I got confused because under my HDFC Net banking under “Social security plans i could see only Pradhan mantri schemes (Accident & Life insurance) but not the APY. You can apply for Atal Pension Yojana as your age is less than 40 but it is not available online. Contact your local bank, there you will have to fill the form on the application. Your bank will help you out on that regard. Age 32, Non Taxable income. PMJJBY &PMSBY activated. Aadhaar Card available. Hi, My question is after subscribing to Atal Pension Yojana, if i die before 60s in that case my beneficiary can continue this scheme? if not what happen if she/he don’t continue? what about the amount already paid? In case if the Atal Pension Yojna holder dies before the age of 60 then the nominee registered at the time of opening account will get pension. Other wise the fund accumulated in the account can be withdrawn. For more information contact your bank. I want pension after 50 yrs. in my wife name & at this time 26 yrs old. Dear sir please suggest me. 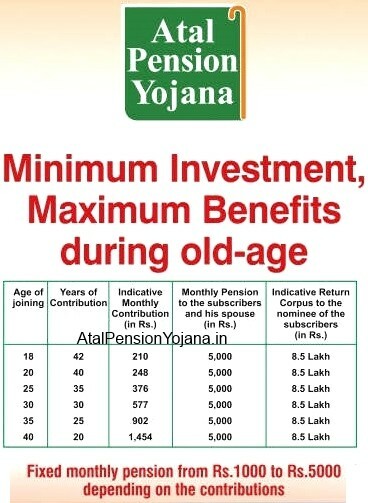 Atal Pension Yojna will start only after the age of 60. Not before that. I have Voter Id, But my Adhar Card have not come yet.. Valid licence & Electricity bill in my mane..Moreover i have an savings account in SBI Siriti-Muchipara Branch. Every time I went to the bank for joining APY, the bank manager turned me down by saying “without ADHAR card,you cant do it”. Moreover the service manager said that their branch will not do any APY scheme. Plz Help me..I want to do it as early as possible. Manger is right on one par,t that without “ADHAR card” you can not avail for Atal Pension Yojana. Secondly, APY is available on all the branches on SBI. In case if you are facing problem then contact SBI customer care and share your problem. Even today I visited the bank, I got the same reply. Atal Pension yojana is available at all the branches of SBI. Call Customer Care to know more about Atal Pension Yojana. Call on this number 1800-180-111 / 1800-110-001 and tell them about the problem. You must have aadhaar card if you want to apply for atal pension yojana. And what happen in case If I pass away after getting pension for few time i.e. suppose at age of 60 years and 4 months, i pass away, what will happen then??? If I opt for Rs 5000 per month pension plan, after attaining age 60, i will start getting 5000 per month, but I want to ask, till what time will i continue to get this amount, i.e. for how many months will i get this amount, till I am alive or what? You will have to contribute till the age of 60. After that as per Atal Pension Yojana, you will start getting pension as per your contribution. This will remain as long your alive. Hope this answers your query. can apply for atal pension yojana online through net banking? To apply for atal pension yojana you must visit your local bank branch and fill the form. For more information you can call your bank customer care no. Hi… My age is 35 and i am NRI…. can i join this scheme…also i am having account in State Bank of Travancore… i am from Kerala… Could you please advise me if i should contact my local bank as i have not got any reply from them as i filled the application form with the adhar card and send it to them. Can the corpus amount under APY be withdrawn by the subscriber after attaining age of 60 years even before his death, whenever he requires it? I don’t think beneficiary of employees provident fund can apply for Atal Pension Yojana. AS per the information from pfrda- even if you are an Income tax payer and have PF A/c and also joined the other TWO PM Schemes i.e PMJJBY &PMSBY still one can join APY. The only issue is you will not get the contribution from Govt.side. This is confirmed on toll free No.1800-110-708. You may also talk to them and get first hand information. You are right on that account. No contribution from Govt.side, if they are connected with other scheme. my age is 47 i have tp pay extra premium whatever for balance 13 year please can i join this scheme. reply me on mail please. The age to join Atal Pension Yojana is between 18 to 40 years. For better accurate information on Atal Pension Yojana contact your local bank. Yes, can apply for Atal Pension Yojana. The minimum age of joining Atal Pension Yojana (APY) is 18 years and maximum age is 40 years. Contact your Bank for more information on Atal Pension Yojana. Age to Join Atal Pension Yojana is between 18-40. swavalamban yojana kay leye aggregator ko paisay jamma karanay hogay.